The following obituary was in the Hinton Daily News, page 3 on September 5, 1994. The following obituary was taken from the Beckley Newspaper. 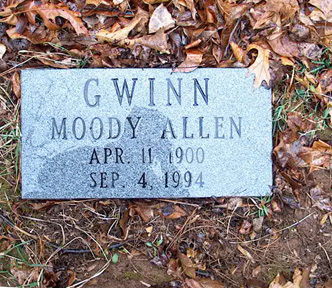 Hinton - Mrs. Moody A. Gwinn, 94, died sunday, Sept. 4, 1994, at her home following a long illness. Born April 11, 1900 at Low Gap, she was the daughter of the late John and Isobell Foster Allen. Mrs. Gwinn was a lifelong resident of Summers County, was a member of hte Miller Memorial Methodist Church in Hinton, retired after 62 years of service from the First National Bank of Hinton and was a 50-year member of the Business and Professional Womens Club. She was preceded in death by her husband, Charles N. Gwinn. Survivors include two nephews, Allen Redman of Boomer and Bob Allen of Columbus, Ohio; three nieces, Barbara Baumbusch of Columbus, Ohio, Mary Elsie Fox of Washington, D.C. and Mrs William P. (Geraldine) Miller of Huntington, and serveral great-nieces and nephews. Memorial services will be 11 a.m. Thursday at Ronald Meadows Funeral Parlors Chapel, Hinton with Pastor J.R. Harshbarger officiating. Burial will follow in the Gwinn Cemetery at Meadow Creek. The family requests donations of sympathy be made to the Miller Memorial Methodist Church, Hinton. Arrangements by Ronald Meadows Funeral Parlors, Hinton.